Peterborough subcontractor Westcombe Engineering has installed a new manufacturing cell to produce increased quantities of a family of aluminium engine components for Perkins Engines. It comprises a Haas ST-30 CNC lathe with short bar feeder, a Blast Wash top-loading washing machine and a vibratory bowl finishing machine from PDJ Vibro, the second to be installed in the factory. Now owned by Peterborough City Council, Westcombe Engineering was established in the early 1970s by philanthropist Royce Westcombe to provide work and development opportunities in manufacturing for people with physical and mental disabilities, of whom 10 currently work at the factory. Together with seven support staff, they produce milled and turned parts mainly for nearby Perkins Engines and its parent group, Caterpillar. Westcombe Engineering’s general and commercial manager, Andrew Lesiw explained, “Our latest manufacturing project is a good example of the applications input that we can provide. When the subcontractor was previously making the parts by the latter production route, porosity in the castings resulted in a significant level of costly scrap. Often, the porosity became apparent only after a lot of value-added machining had been completed, which further increased the unit manufacturing cost of each good part. The new process, which became operational in March 2017, eliminates the problem and also reduces the amount of metal removal, allowing Westcombe Engineering to save production costs and reduce prices for the customer while still maintaining a good profit margin. It is important for the subcontractor to be competitive to ensure long-term financial viability, as there are no subsidies underpinning the operation. 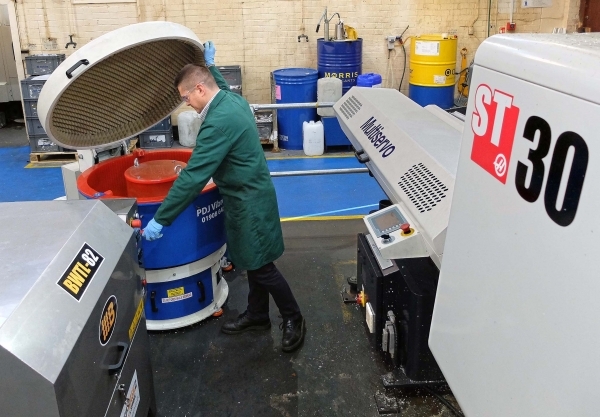 But why the importance of vibratory finishing? While the latest vibratory bowl, a 100-litre capacity model, is dedicated to finishing these specific Perkins engine parts, the original 220-litre bowl was installed in 2012 to automate deburring and edge-breaking of components machined in all of Westcombe Engineering’s machine tools from aluminium, cast iron, brass, stainless and mild steels, exotic metals and plastics. The intention was to eliminate mundane, manual finishing tasks and improve consistency of finish and the PDJ Vibro equipment succeeded in achieving both aims. 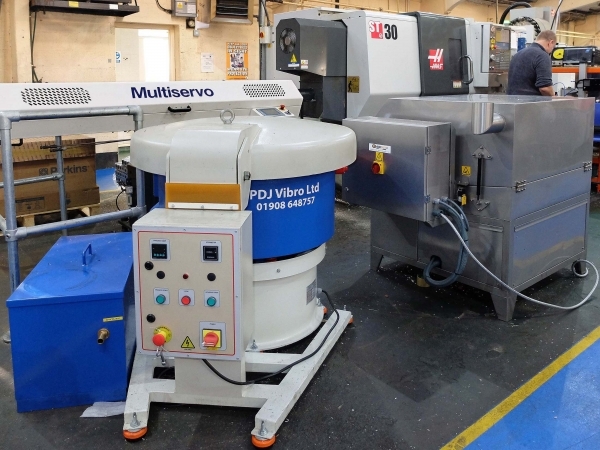 Based on the first bowl’s reliability and effectiveness, Westcombe Engineering returned to PDJ Vibro to order a smaller finishing machine for integration into the Perkins engine cell. Mr Lesiw offered the comment that the supplier’s extensive knowledge of finishing technology was helpful during product selection and also said that the enquiry was dealt with promptly and efficiently. Both bowls are equipped with hinged, acoustic covers to attenuate the sound transmitted into the working environment from what is inherently a noisy process. They also have a screen for automatic separation of the processed components from the mixture of ceramic abrasive stones and liquid detergent on reversal of the direction of motion. Consequently, an operator does not have to delve into the bowl to extricate finished components by hand, an activity that is one of the least popular in any factory. Westcombe Engineering is currently undergoing expansion. Historically almost exclusively a supplier to Perkins and Caterpillar, the subcontractor has extended its customer base to include manufacturers in the oil and gas, food, fitness equipment, materials handling and most recently posture seating (think Prof Stephen Hawking) sectors. As a result of this diversification coupled with growth in business within the Caterpillar group, turnover has increased by 25 per cent within the last 18 months and looks set to grow further. Investment in modern Hwacheon, Hardinge, DMG Mori and Chiron machine tools in 2016 alone provides a clue to the subcontractor’s ambition. The company recruits disabled men and women of any age wishing to become CNC machinists, its goal being to prepare employees for work in the outside world that would otherwise be unemployed or struggle to find gainful employment. However, the success of the organisation has been such that this goal is rarely realised. Almost all staff choose to stay at the Peterborough factory, the longest serving employee having been there for 39 years. For an organisation that states in its literature, “These workers are our greatest asset and their contribution to the business has, over the years, been immense”, long-term retention of its staff can only be beneficial for all concerned.